A teaser poster has been unveiled for David Gordon Green's Halloween sequel. Blumhouse have been keeping a tight lid on plot details of their upcoming Halloween sequel, but we do know it takes place 40 years after the events of the first movie and ignores all the sequels, which presumably means Michael Myers and Laurie Strode aren't brother and sister in this take. 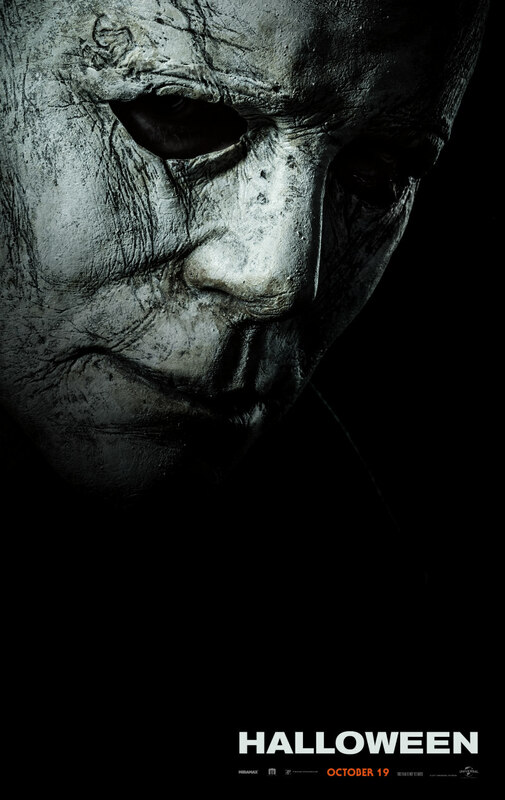 Any time a new Halloween movie is announced, horror fans begin wondering what the mask will look like, and as evidenced on the first teaser poster below, it appears that Myers will be sporting a battered and wrinkly 40-year-old version of the original, famously a reconstituted William Shatner mask. It also seems the title is simply Halloween, though rumours are floating around that the film was test screened under the title 'Halloween: H40'. Halloween (if that is its title) is directed by David Gordon Green and co-written by Danny McBride. Jamie Lee Curtis returns to the role of Laurie, with Judy Greer playing her daughter and Andi Matichak her granddaughter. Myers will be played by both original performer Nick Castle and stuntman James Jude Courtney. John Carpenter executive produces and is rumoured to be scoring the film too. Halloween is in UK/ROI cinemas October 19th.